Scion's back again in Austin. 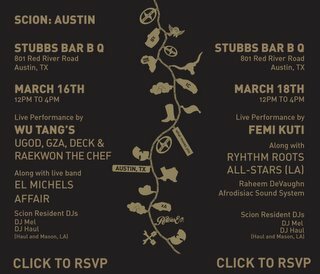 On March 16th, at Stubb's, we have U-God, GZA, Deck, and Raekwon from the Wu-Tang Clan. Also the band El Michels Affair will be playing! And also Austin's own DJ Mel and also DJ Haul will be spinning. Should be a great show! I've been meaning to see El Michels Affair for a VERY long time!